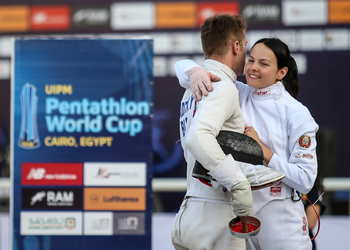 Italy prevented France from winning a clean sweep at UIPM 2018 Pentathlon World Cup Cairo as Gloria Tocchi and Gianluca Micozzi claimed gold in the Mixed Relay. France (Elodie Clouvel & Valentin Belaud) were aiming to win their third gold in consecutive days but they conceded 44 penalties in Riding and this enabled Italy (Tocchi/Micozzi) to start the Laser-Run with a lead that they protected with great determination. France (Clouvel/Belaud) could not catch their European rivals but they did manage to overtake Kazakhstan (Elena Potapenko & Vladislav Sukharev) to claim silver. That meant France finished the opening Pentathlon World Cup of the season with an exceptional two gold and two silver medals. With deep stocks of talent, Italy are always competitive in the Mixed Relay and they put themselves in contention for gold with outstanding Fencing and Riding. 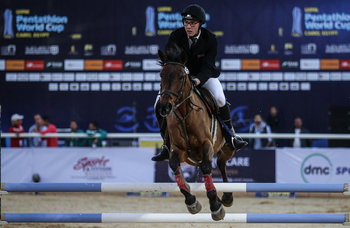 Competing alongside his experienced partner, victory in Cairo was a big senior breakthrough for 21-year-old Micozzi (ITA), who said: “Today was a very difficult day but we still succeeded in the end. Here in Cairo, the event was wonderful, it is a nice place here and the club is great and the organisation was perfect. Behind the medallists, Tokyo 2020 Olympic Games hosts Japan (Shino Yamanaka & Koji Yamamoto) finished strongly in 4th while Russia (Uliana Batashova & Alexander Savkin) were 5th and Argentina’s husband-and-wife team (Iryna Khokhlova & Emanuel Zapata) 6th. It was not an auspicious start for Italy in the pool, where they took 8th place. Great Britain (Charlie Follett & Myles Pillage) shaded France (Clouvel/Belaud) for the fastest time of 1:57.40 with Kazakhstan (Potapenko/Sukharev) not far behind. In the Fencing hall, Italy (Tocchi/Micozzi) clearly stood out with an excellent 23V/13D, three victories ahead of Belarus (Tatsiana Khaldoba & Yaraslau Radziuk), Argentina (Khokhlova/Zapata) and France (Clouvel/Belaud). Belarus (Khaldoba/Radziuk) strengthened their position with the two final victories in the Bonus Round, putting themselves in 3rd place overall. Having entered the arena in a podium position, Belarus (Khaldoba/Radziuk) fell out of contention with a series of misadventures that cost them a massive 103 penalty points. Italy (Tocchi/Micozzi) ensured they would start the Laser-Run in pole position after two excellent rides that brought them within two points of a perfect Mixed Relay round. There were good performances from Japan (Yamanaka/Iwamoto) and Kazakhstan (Potapenko/Sukharev) and they all gained from the difficulties encountered by France (Clouvel/Belaud). Tocchi (ITA) looked like she was labouring at times during her two 800m laps but she did enough to keep Potapenko (KAZ) although Clouvel (FRA) reduced the deficit before handing over to her boyfriend Belaud (FRA). 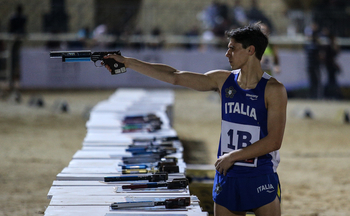 The 2016 individual world champion could see the two targets in front of him, Sukharev (KAZ) and Micozzi (ITA), but only one of them proved to be within reach. Belaud (FRA) kept up the pressure with two rapid shoots, and ultimately France made up 25secs on the leaders Italy during the Laser-Run, but it was not enough to deny them gold and Micozzi (ITA) showed excellent composure and good running speed to make sure he and Tocchi (ITA) went home with the top prize. Janusz Peciak (POL), the 1976 Olympic champion and UIPM Executive Board Member for Sport, said: “In such a high-quality field of 10 nations, it was always going to be hard to pick a winner in today’s Mixed Relay and I was very impressed with the way Italy dominated in Fencing and Riding and protected their lead in the Laser-Run. 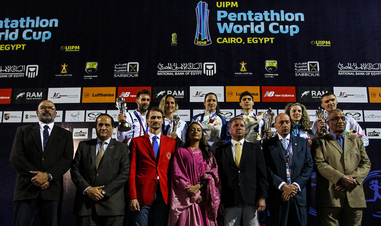 “The French team should be congratulated on a very special opening Pentathlon World Cup of the season. With so much competition from nations from all continents, two gold and two silver medals is an incredible result and they have set a high standard for the rest of the season. 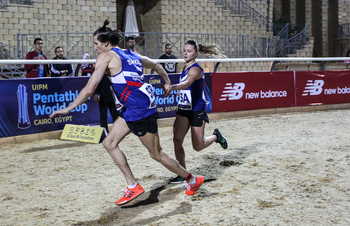 The next event on the 2018 UIPM calendar is Pentathlon World Cup Los Angeles (March 26-30), where live coverage of the finals will be available on UIPMTV with live results on the UIPM website.